Beautiful Summary of the Christian Faith including the words of the Apostles and Nicene Creeds. “What, then, is necessary for a Christian to believe?” asks the Heidelberg Catechism. “All that is promised us in the gospel, which the articles of our catholic, undoubted Christian faith teach us in summary,” is the reply. Though this creed was not penned by the Apostles, it summarizes their teaching with simplicity, brevity, and beauty. Originally used as a baptismal formula in the second century, it reached its present form in the sixth. It gives a concise expression of the fundamentals of historic Christianity. If you're wondering what a word or phrase means, CLICK on them and you'll be taken to the explanation. Then scroll down to the word or phrase you'd like to learn more about. This creed is an accurate and majestic formu­lation of the historic faith of orthodox Christianity. Originating at the Council of Nicea (AD 325), and revised at the Council of Constantinople (AD 381), it affirmed the biblical doctrine of the Trinity and the Person of Christ in opposition to various heresies, especially Arianism. The Western Church added the article on the procession of the Holy Spirit from Christ, “and the Son” (Latin: filioque) when it was adopted in its present form at the Council of Toledo (AD 589). not made, being of one substance with the Father, by whom all things were made. 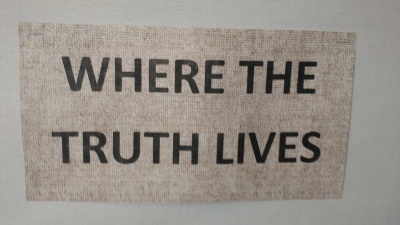 and Do You Believe It? During a recent outreach project, I decided to make some booklets available that showed the basic truths of the Christian Faith. THE COMPLETE GOSPEL explains both whatthe Gospel IS and what it MEANS TO BELIEVE IT! The Truths of the Gospel Are Clear! Thank you for taking the time to read this booklet. As you will see, this is not a typical tract about the Gospel. There are not just a few basic truths to be believed. Christianity is all-encompassing. It’s not a question of how little we need to believe, but how much. We will show you how the essential truths of the Gospel are linked together, and what it means to truly believe. We will show you the content of the Gospel and then examine whether those beliefs have impacted your life as they ought. To be clear, our starting point is that the Holy Bible is the only inspired, authoritative and infallible Word of God. It alone is God’s revelation, given and preserved for our benefit. It conveys what we need to know about God, ourselves and the world in which we live. It makes clear that God is the Almighty Creator and worthy to be praised. Although we were made in His image to know and worship Him, we all have sinned and fall short of the glory of God. The Scriptures teach that God sent His Son into the world to redeem His people from their lost and sinful condition. This story begins with God and the creation of all things. It speaks of humanity’s fall into sin and the promise of redemption. This promise is fulfilled with the first coming of the Lord Jesus Christ. It will culminate when He comes again in glory to judge the living and the dead. While you may have heard some of these things before, this booklet encourages you to compare what you believe with how faithful believers and churches throughout history have understood and confessed the Bible’s message. We encourage you to examine “the faith once for all delivered to the saints” (Jude 3). May the Lord bless your consideration of these things! Instead of explaining why you should believe, or the bare minimum of what you must believe to be saved, this presentation of the Gospel seeks to summarize what it means to believe the Gospel as a whole. It looks at faith from the Bible’s point of view. The Complete Gospel provides the context in which the Gospel of Jesus Christ makes sense. The Christian Church has been around for hundreds and even thousands of years. God’s redemptive plan began long ago and is recorded in the pages of the Old and New Testaments. God’s purpose from the beginning was to send His Son in the fullness of time to become the Redeemer of people. This booklet is a summary of the faith once for all delivered to the saints (Jude 3). What the gospel is and what it means is set forth with clarity on the pages before you. The Gospel is what God has revealed in His Word. The Good-news is that sinful human beings are being forgiven and redeemed through the completed work of the Lord Jesus Christ. In addition to the Gospel, we learn in Scripture the nature and works of God Himself. Our goal is to plainly teach what the Bible reveals as its key or essential doctrines. Unlike most cults and false religions, we believe the historic teachings of the Church are the best place to begin. And what are these teachings? In short, they are the basic tenants of the Christian faith. While there are many different denominations and types of churches, it is important to remember that most churches agree on the fundamental teachings and truths of the Holy Bible. While there are some differences and variations in how these things are understood, all faithful Christian churches will acknowledge that the Scriptures are the only inspired and authoritative Word of God. Subsequently, all faithful Christian churches affirm the eternal existence of GOD and regard Him as the Almighty, All-Wise Creator of the heavens and the earth. They believe God made man male and female as a special creation in His image. Soon after their creation our first parents sinned and brought spiritual death upon themselves and their descendants. They yielded to the temptation of Satan and ate from the Tree of the Knowledge of Good and Evil. Without God’s intervention, Adam and Eve and their descendants would have remained spiritually dead. But thankfully, the next thing we read is God’s promise to redeem them through the Seed of the woman and overcome their sin and Satan’s power. This is the underlying story of the Old Testament that concludes with the coming of Christ in the New. In other words, we believe all that is revealed in the Bible, from the early chapters of Genesis to the end of the New Testament. More than this, we believe what the Christian church is documented to have always believed. The ancient creeds were written and/or adopted by the early church councils. These councils met to settle important doctrinal issues like the Trinity, that the One True God has revealed Himself in three distinct persons: Father, Son, and Holy Spirit. Other church councils ironed out how the Lord Jesus came as both true God and true man, having two natures in one person. Some of this is quite complicated, but the Church clearly states what we must confess and deny to avoid pitfalls and error. During the Protestant Reformation (the great spiritual revival in the 16th and 17th Centuries) confessions and instructional catechisms were written to clarify and summarize what the Protestant Churches believed. These doctrinal standards, known as the Three Forms of Unity, consist of the Heidelberg Catechism, the Belgic Confession and the Canons of Dort. Each of these summarizes the fundamental teachings of the Bible and have been adopted and widely used by faithful churches ever since. The Heidelberg Catechism, written in 1561, has been embraced by churches and believers around the world. It captures the essential truths in a pastoral way and applies them to the hearts and lives of believers. 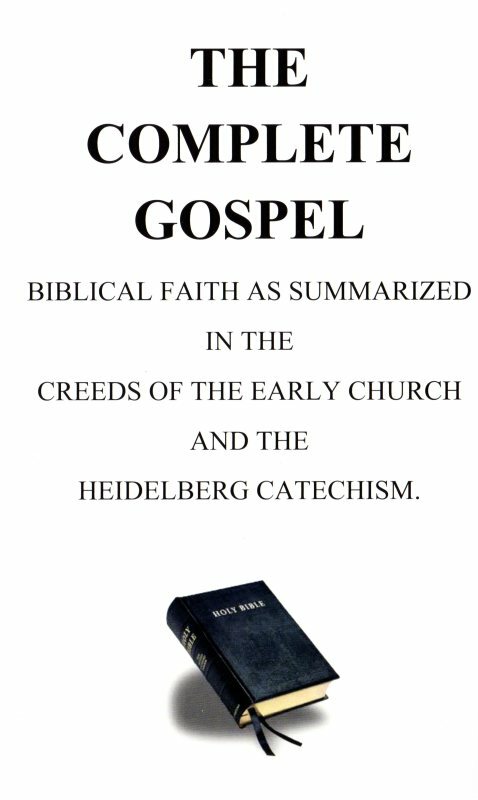 The authors of the Heidelberg Catechism identify the key elements of what we as believers need to know. For the last 450 years, churches and parents have been using it to teach their children what they need to know about the Christian Faith. It has enabled them to faithfully serve the Lord through many generations. Those who have learned these truths are able to give clear and concise reasons for the hope that is within them. Since there is “no variation or shadow of turning” with God and Jesus says, “heaven and earth will pass away, but my words shall by no means pass away,” we can be sure that God and the truths of the Bible will NOT change. The Bible emphatically warns that nothing may be added to or removed from the Word of God. In the last verses of the Bible, the severest of warnings are given to those who would do so. But even if we, or an angel from heaven, preach any other gospel to you than what we have preached to you, let him be accursed. As we have said before, so now I say again if anyone preaches any other gospel to you than what you have received, let him be accursed. Think about this for a moment. Paul and other apostles testified of the truths they had learned and been taught by Christ and the Holy Spirit. This was the message they preached and the Galatian churches had heard. Additionally, this was what the Holy Spirit inspired them to write and record in the books and letters of the New Testament. In short, “any other gospel” would be any teaching or preaching that doesn’t agree with what the apostles taught. Notice, what he says, “Even if we [he and the other apostles] or an angel from heaven preach any other gospel than what we have preached to you, let him be accursed.” Oh, that false teachers and the founders of cults and religions had embraced these verses and not gone beyond what had been written. WHAT DOES TRUE FAITH BELIEVE? So far we’ve written about the objective truths that are taught in the Word of God. This is what we as believers and all Christian churches believe. As you read these paragraphs you might be wondering how your beliefs compare with what is recorded here. Our hope is that each of us will be challenged to read and reread the Scriptures to see whether or not they teach what is set forth here. Below are a couple questions and answers from the Heidelberg Catechism that address the subject of true faith and what it means. QA 20. Are all men, then, saved by Christ as they have perished in Adam? QA 21. What is true faith? True faith is not only a sure knowledge whereby I hold for truth all that God has revealed to us in His Word but also a hearty trust, which the Holy Spirit works in me by the Gospel, that not only to others, but to me also, forgiveness of sins, everlasting righteousness, and salvation are freely given by God, merely of grace, only for the sake of Christ’s merits. 1.) Those without real or true faith are not truly connected to Christ and will perish in their sins. 2.) Those with true faith come to believe all that God has revealed in His Word. This is a pretty exhaustive statement and witnesses to the Holy Spirit’s presence and work in our lives. Believers come to accept the miracles, signs, and wonders as real, and God’s promises and commands as trust-worthy. 3.) In addition to believing what is objectively revealed or stated in Scripture, true faith believes something more. It rests on a settled conviction that apart from earning or deserving, they have been brought into a state of grace or favor with God. By the Spirit of God, they are graciously called and received into fellowship with the Living God. They confidently trust that their salvation was fully paid by the one sacrifice of Christ on the cross. QA 1. What is your only comfort in life and in death? That I, with body and soul, both in life and in death, am not my own, but belong to my faithful Savior Jesus Christ, who with His precious blood has fully satisfied for all my sins, and redeemed me from all the power of the devil; and so preserves me that without the will of my Father in heaven not a hair can fall from my head; indeed, that all things must work together for my salvation. Wherefore, by His Holy Spirit, He also assures me of eternal life and makes me heartily willing and ready from now on to live unto Him. Genuine Christianity is not hard to understand or overly complicated. It teaches believers to put their trust completely in the grace of God, in the words and promise of the Gospel. This is the focus: that God for the sake of Christ’s completed work grants forgiveness of sins and everlasting life to all who come to Him through faith. The Lord Jesus through the ministry of His Spirit and Word, gathers, defends, and preserves for himself a chosen people, from every tribe, language, nation, and people, in the unity of the true faith. There may be a few cultural differences, but believers of every language, race, and nation will believe in the same Gospel and serve the Lord in the same way. Do you genuinely believe these things? Has your life been transformed by the power of the Gospel? These are pretty serious questions. Knowing the right answers or knowing what we should say is not the same thing as really believing or experiencing the things being described. As believers, we are to diligently seek from God what He has freely given. This is where the Church’s creeds and confessions are helpful. As we read through them, we will either agree with them or we won’t. We will share the convictions and experience grace in the way it is described, or we won’t. As you read through these creeds and the Heidelberg Catechism, ask yourself whether they describe your faith. Is this what you believe and are you serving the Lord as you should? In a sense, this booklet challenges each of us to examine the content of our faith and measure our experience as believers. The 129 questions and answers accurately and extensively describe what the Gospel is and what it means to genuinely believe. In the pages that follow we will look at the creeds of the early church and the Heidelberg Catechism’s explanation of what true faith believes. QA 2. How many things are necessary for you to know, that in this comfort you may live and die happily? This, with the summary of the Gospel in QA 1, is exactly of what every Christian needs to understand and believe to exercise true faith in the Gospel of Jesus Christ.